A sleek looking scale for your kitchen! The Taylor Biggest Loser Digital Food Scale is a perfect food scale for measuring ingredients, servings, or produce to obtain accurate information for your cooking and eating requirements. The digital read out is easy to decipher and more reliable than the standard dial scale.The see-through glass top surface gives a contemporary look to this important item. Use it in the kitchen or try weighing your latest catch when fishing. Digital read-out Is visually easy to decipher and more accurate than a standard dial scale. 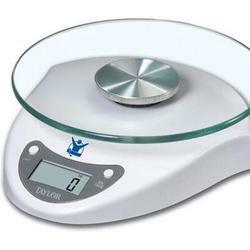 Glass top Provides a large surface for holding items being weighed and makes scale look lighter in appearance. Smooth, clean lines Offer a contemporary look for any decor.